Bloggers hangout present a simple way to add recent posts gadget to sidebar. Recent posts gadget is a gadget which displays recent posts in the sidebar. It displays post title, thumbnail of image, post description of your wish, comments and read more link. It was developed by bloggerplugins.org. The page views of your blog will definitely increases in few days as I had a personal experience with my blog. It makes your blog look professional. Step 2: Choose a blog from the dashboard for which you want to add recent posts gadget. Step 3: Select Design>PageElements and click add a gadget from the side bar and you will be taken to a window called add a gadget. In that widow search for recent posts as shown below. 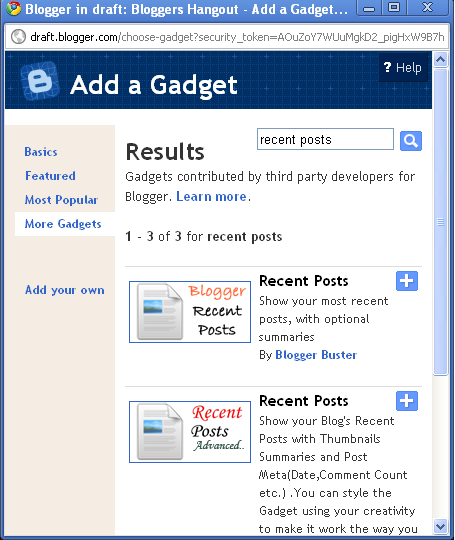 And click plus symbol for adding the gadget( Bloggerplugins.org ) to your layout. Step 4: Save the Template layout. Note: This Gadgets seems to have some problem when seen in preview. It displays a google error due to request- uri is too large but it perfectly works in normal view. Thats it! You have successfully added recent posts gadget to sidebar. If you have any doubt in " How To Add Recent Posts Gadget To Sidebar" don't hesitate to comment.